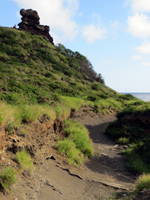 Discover Pele’s Chair and a Secluded Cove on the Kaiwi Shoreline Trail. 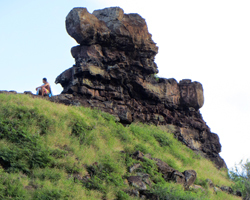 Discover Pele's Chair and a Rare Secluded Oahu Beach! However, directly below Pele’s chair is a secluded cove of crystal-clear water and surprisingly expansive clean white sand. 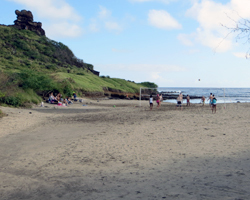 Plan to add some play time at this semi-private beach – one of the few left on Oahu – and you’ve got yourself a nice little excursion! The cove is fairly protected from the usual rough surf in the area, so unless waves happen to be rolling directly into the cove that day, it’s often a safe place to swim and/or go snorkeling. 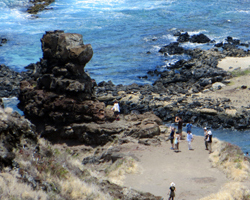 There’s a soft, sandy bottom and even some tide pools to explore. Look out across the Kaiwi Channel on a clear day and you should be able to see the islands of Molokai, Lanai, and Maui! If you’re there between approximately December and May (January to March is best), you should also keep your eyes open for migrating humpback whales. The trail itself, however, is not much of a nature walk. Don’t let these pictures fool you. I did this hike in January after it had rained for two or three weeks. 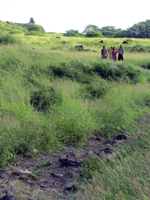 Normally, this part of the island is as dry as a desert; and the plant life usually comes in various shades of brown. There are no facilities (water fountains and/or restrooms) along the Pele’s Chair trail. 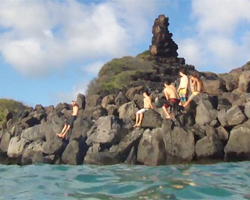 The nearest such facilities are down at Makapuu Beach. You’ll want to take care of business before you start hiking and bring plenty of water. You’ll also want to make sure you apply plenty of sunscreen, because there is precious-little shade along the trail and/or at the beach. 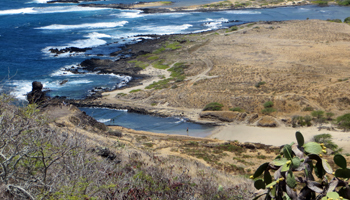 Although the cove below Pele’s Chair is relatively safe from the surf, the closer you get to the open water (and/or to the water’s edge when you’re up on the rocks), the more dangerous things become (especially when your back is turned to the waves). If you’re not careful, these waves could easily knock you into all kinds of peril! So pay attention to what’s going on around you. There is no lifeguard at this remote location so your decision to play in or around the water is at your own risk. Disclaimer: Stupidity and carelessness can kill you. Use your brain and take responsibility for your own safety. Know the limits of your ability and stay within them. Watch your kids like a hawk. Heed posted warning signs. Never turn your back to the waves. Take this guidance, mix it with your own good judgment, and live to enjoy the rest of your Hawaii adventure vacation.